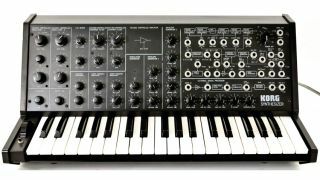 The MS-20 is back... and in many different guises. While other big-name manufacturers steadfastly resist delving into their own pasts, Japanese instrument manufacturer Korg has heeded the pleas of electronic musicians everywhere. The company's recent hardware offerings certainly have a vintage vibe to them, even drawing on retro products from rival companies. Korg was among the first to embrace the idea of virtual recreations of its own classic kit, too, recreating a stream of legendary Korg instruments for both desktop and mobile devices. One ancient Korg stands proudly over them all, demanding the most attention: the legendary MS-20 semi-modular synthesiser. Unleashed in 1978, it was intended as a simplified, monophonic version of the company's massive (and expensive) PS series of polyphonic analogue synths. Like those bulky behemoths, the MS-20 offers a normalled (ie, pre-routed) signal path that can be overridden with a patchbay that comprises the right half of the slanted vertical front panel. "The MS-20 really shone in the hands of purveyors of industrial and aggressive dance styles, and experimentalists embraced its ability to bypass the standard signal path to create unconventional timbres." With a pair of VCOs, noise, ring modulation, LFO, and a pair of envelope generators, this diminutive dynamo offered enough to impress even without that modular-style patch field. Add to that a pair of 12dB filters (high- and low-pass), each with rip-snortin' resonance (called "peak" here), and you have an instrument with a decidedly edgy character. The MS-20 really shone in the hands of purveyors of industrial and aggressive dance styles, and experimentalists embraced its ability to bypass the standard signal path to create unconventional timbres - Aphex Twin (Richard James) and The Legendary Pink Dots' Phil Knight are longtime proponents, the latter still hauling his out on tour year after year. Savvy readers may have noticed that the MS-20 bears some resemblance to the ARP 2600 and the EMS VCS3. While they don't sound the same, they all share some common features, not least being the fact that they all allow external signals to be shunted through their innards, making them an interesting candidate for processing, say, guitars, drums or vocals. Something of a dinosaur even at the time of its release, the MS-20 sold respectfully well for a few years and then vanished from the catalogue. Yet enough were made to keep it in the public eye, increasing desire and secondhand prices among aficionados of audio esoterica. When that desire coalesced into a frenzy, Korg heeded the call. You can now buy a new "mini" version of the MS-20, or even a full-sized kit, and that's in addition to Korg's own official plugin emulations. And why wouldn't you? The MS-20 is an ideal instrument on which to learn the arcane art of synthesis, but more than that, it has a sound all its own. Bright, brutal, brash - the sound of this brilliant blast from the past translates perfectly into today's musical styles. Let's hope it sticks around this time! Originally bundled with a mini hardware replica of the real deal as part of the Legacy Collection, you can now get Korg's own virtual VST/AU/RTAS version of the MS-20 on its own. Fully patchable and with modern niceties like unison and MIDI sync, this is the real deal by the company that invented the thing. Korg was among the first hardware manufacturers to embrace iOS - first with its stunning iElectribe and then with this, a tablet-based recreation of the MS-20 that throws in a virtual version of the lustworthy SQ-10 analogue sequencer. Additionally, there's a wicked MS-20-based drum machine. Awesome for making tunes on the fly. Not strictly based on the MS-20 but rather its littler brother, the single-oscillator MS-10, the DS-10 has the distinction of packing an awful lot of power into what amounts to a plaything, the handheld Nintendo DS game system. The DS-10 offers a convincing sound from dual oscillators (like the MS-20), built-in sequencing and X/Y control.